Mini-Summary: Two best friends, John and Lorraine, meet a lonely old man, Mr. Pignati, and befriend him, learning the harsh truths of life, love, and death along the way. I am constantly on the lookout for popular children’s/ YA books that I missed out on earlier in my life. I first heard about The Pigman in a Young Adult Literature course some years ago, and my colleagues spoke of this book fondly and excitedly. So, I finally got around to reading it, and I’m very glad that I did. 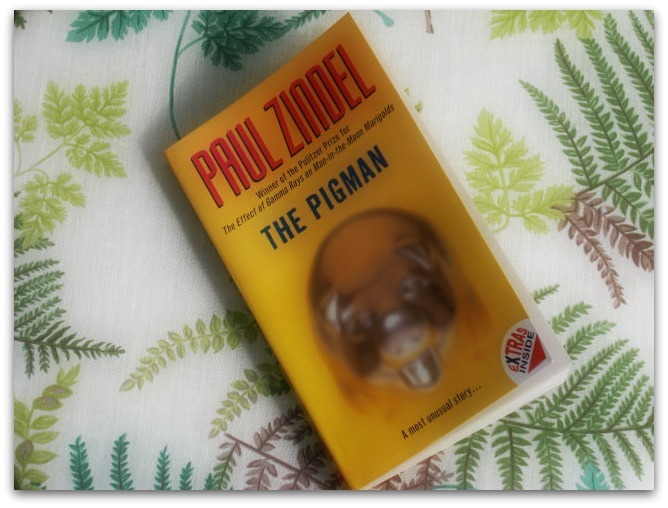 Zindel expertly tackles tragedy and death through the character of the Pigman. Mr. Pignati’s fragile psyche and his extended mourning over his wife are truly heartbreaking. He is desperate for some companionship and love, and finds these things through the animals in the zoo and through two kids who don’t wholly understand the dire impact of their actions. What I find brilliant is that though the book is more about John and Lorraine than it is about Mr. Pignati, the Pigman’s relationship with them and the events that revolve around him matures the two characters and helps them better understand themselves. His character is what sets things in motion. I really appreciated the textual elements added to the book: pictures, maps, sketches, hand-written letters. They break up the monotony of the plain text, and they also add more personality to the story. You can literally see the word games the characters played together and the signed certificate they discovered, etc. Sure, you can envision these elements yourself, but seeing them adds new dimension and character. Same goes for John’s code for cursing: “I’ll go like @#$% if it’s a mild curse… If it’s going to be a revolting curse, I’ll just put a three in front of it—like 3@#$%-- and then you’ll know it’s the raunchiest curse you can think of” (5). This makes John and the reader like co- conspirators; it felt like I was scheming with him, and it fosters a connection. My favorite aspect of the story was the subtle unveiling of adult hypocrisy. Throughout their narratives, both John and Lorraine enumerate different ways they see their parents acting against the directions they give their own children. Never steal or accept free gifts! …But Lorraine’s mother helps herself to her patient’s belongings through some distorted sense of entitlement. Be yourself! …But John’s father only wants John to take the job he wants him to have, the one that is actually slowly stressing and killing him. “I only hope I won’t be that kind of adult” (27). “I felt sorry for the old man because people just don’t go around smiling like that all the time unless they’re mentally unbalanced or harboring extreme anxiety” (52-3). “I’ve always wondered about those cases where a man and wife die within a short time of each other. Sometimes it’s only days. It makes me think that the love between a man and a woman must be the strongest thing in the world” (76). “It’s sort of spooky when you start talking to God nowadays everybody thinks you’re nuts. They used to call you a prophet” (81). “What did she want from me—to tell the truth all the time? To run around saying it did matter to me that I live in a world where you can grow old and be alone and have to get down on your hands and knees and beg for friends? A place where people just sort of forget about you because you get a little old and your mind’s a bit senile or silly?” (160). “Didn’t she know how sick to my stomach it made me feel to know it’s possible to end your life with only a baboon to talk to? And maybe Lorraine and I were only a different kind of baboon in a way. Maybe we were all baboons for that matter—big blabbing baboons—smiling away and not really caring what was going on as long as there were enough peanuts bouncing around to think about” (161). “The police and attendants moved calmly, surely, as if they were performing a ritual and had forgotten the meaning of it. I don’t think they ever knew the meaning of it. I thought of machinery—automatic, constant, unable to be stopped” (164).